DataStax Enterprise comes bundled with enterprise management services that you can configure and run using OpsCenter. Describes the Backup Service, which allows you to automatically or manually backup and restore data in your clusters. Clone cluster data from one DSE cluster to another, or from a designated other location using the Restore Backup feature in OpsCenter. Clone cluster data from one DSE cluster to another using the Restore Backup feature in OpsCenter. This workflow requires the source and target clusters to both be managed by the same OpsCenter instance. The Backup Service allows you to backup and restore your cluster data. Why use the Backup Service? The Backup Service provides backup and recovery for an enterprise's data even though DataStax Enterprise has built-in replication. Configure Backup Service options in the OpsCenter UI such as commitlog backup location, available disk space thresholds, and encryption key storage. Configure other options that effect the Backup Service, such as agent configurations for uploading extremely large files or continuing restores after a download failure. OpsCenter provides a way to schedule and run backup operations on a cluster. Restore the data in a cluster from the stored backups. Clone cluster data from one DSE cluster to another using the Restore Backup feature in OpsCenter. This workflow does not require the source and target clusters to both be managed by the same OpsCenter instance. This workflow does not necessarily even require another existing cluster instance. The data can be cloned providing it was backed up to an available Local FS or an Amazon S3 location. Guidelines for backing up and restoring DSE Graphs using the OpsCenter Backup Service. DataStax recommends upgrading to OpsCenter 6.5 to take advantage of simplified backups and restores for DSE Graphs. View in-process and completed backup or restore operations in OpsCenter, and synchronize the OpsCenter UI with the history log. Delete backup data that your organization no longer needs to retain. The Backup Service retains the backup history. Solutions to errors encountered when using the Backup Service. The Repair Service is configured to run continuously and perform repair operations across a DataStax Enterprise cluster in a minimally impactful way. Using trend analysis and forecasting, the Capacity Service helps you understand cluster performance within its current environment and workload, and gain a better sense of how time affects those trends, both past and future. The Best Practice service allows scheduling pre-defined best practice rules that check various properties of clusters and environments and report back which nodes pass or fail the rules. The OpsCenter Performance Service combines OpsCenter metrics with CQL-based diagnostic tables populated by the DSE Performance Service to help understand, tune, and optimize cluster performance. Visually enable the performance objects and analyze the results within OpsCenter. 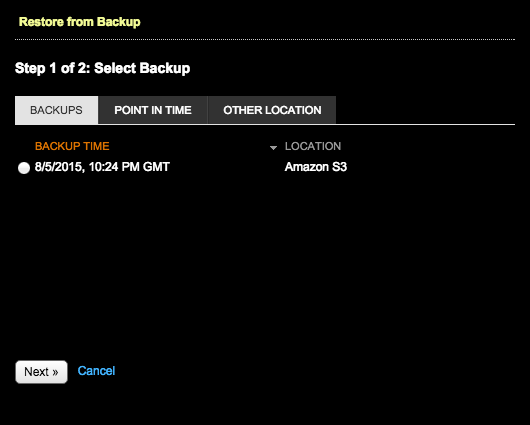 To clone the cluster data, there must be an existing backup of the cluster to a Local FS or an Amazon S3 location. See adding a backup location. Note: Cloning encrypted tables to a different cluster does not work unless the encryption keys are identical, which is typically not the case. Important: The Backup Service requires control over the data and structure of its destination locations. The AWS S3 bucket and the Local file system destinations must be dedicated for use only by OpsCenter. Any additional directories or files in those destinations can prevent the Backup Service from properly conducting a Backup or Restore operation. Click the source cluster name > Services. Click the Details link for the Backup Service. In the Activity tab, click Restore Backup. The Restore from Backup dialog appears. In the Backups tab, select the backup that contains the data you want to clone and click Next. Select the tables included in the backup you want to restore. Click the keyspace name to include all the tables in the keyspace. Click All Keyspaces to restore all the keyspaces. To select only specific tables, expand the keyspace name and select the tables. Restoring a snapshot that contains only the system keyspace is not allowed. There must be both system and non-system keyspaces, or only non-system keyspaces in the snapshot you want to restore. Restoring a snapshot that does not contain a table definition is not allowed. Restoring a snapshot to a location with insufficient disk space fails. The Restore Report indicates which nodes do not have sufficient space and how much space is necessary for a successful restore. For more information and tips for preventative measures, see Monitoring sufficient disk space for restoring backups. Under Location, select the target cluster for the restored data. Select a different cluster than the one that was backed up to clone the data to the cluster. The Location list is only available when there are multiple clusters and both clusters are managed by the same instance of OpsCenter. To remove the existing keyspace data before the data is restored, select Truncate/delete existing data before restore. This completely removes any updated data in the cluster for the keyspaces you are restoring. To prevent overloading the network, set a maximum transfer rate for the restore. Select Throttle stream throughput at ____ MB and set the maximum MB per second. Change the staging directory if necessary by setting the backup_staging_directory configuration option in address.yaml. Click Start Restore to confirm when prompted. If the pre-restore checks detected schema differences that could not automatically be validated, the Restore Schema Validation dialog appears. 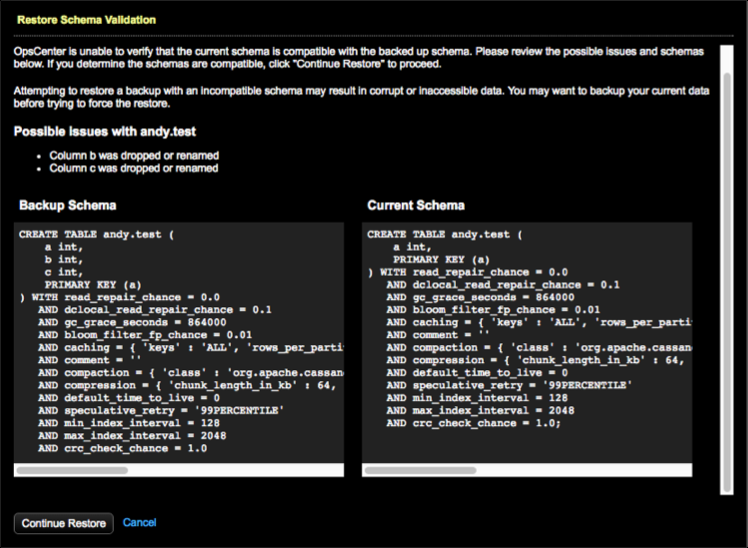 Possible issues are listed and a comparison of the backup and current schema are presented side-by-side. To rectify the schema issues and try the restore again afterward, click Cancel. To proceed despite the schema mismatch, click Continue Restore. Warning: Attempting to restore a backup with an incompatible schema might result in corrupt or inaccessible data. Before forcing the restore, you might want to back up your current data. The details and progress of the restore operation are displayed in a progress dialog, and also appear in the Backup Activity of the target cluster. If you close the progress dialog, track the progress and status of the restore in the target cluster's Backup Activity section. The progress and details of the restore operation are displayed in the Restore Report.